KINGSTON, N.Y. – Kingston Stockade FC Head Coach Jamal Lis-Simmons has announced his Technical Staff for the 2019 National Premier Soccer League (NPSL) season, with Jimmy Ventriglia and Rory Becker serving as assistant coaches, Steve Skonieczny joining the staff as goalkeeping coach, and John Nunez remaining Director of Sports Performance and Rehab. The staff has a great deal of both playing and coaching experience, as well as familiarity with Stockade FC. Lis-Simmons, Becker, and Skonieczny have been with the club since its inception, and Nunez enters his second season in his current role on the staff. Ventriglia, a former high school teammate of Lis-Simmons’, set records as a player and has also an accomplished coaching history. Ventriglia joins Stockade FC for his first season as assistant coach. A former Highland High School standout where he played alongside Lis-Simmons, Ventriglia set a Tri-County record with 117 goals for the Huskies before moving on to play at Division-I Colgate University. Ventriglia spent 5 years as an assistant coach for the Army women’s soccer program, leading the Black Knights to a 43-40-13 record, and led the Marlboro high school varsity boys to a Mid-Hudson Athletic League (MHAL) title in 2011. He holds a National Soccer Coaches Association of America (NSCAA) National Diploma. Becker enters his fourth season as Stockade FC assistant coach, the only coach who has been on the sidelines since the club’s start in 2016. Becker spent six years as an assistant with SUNY New Paltz and five years as an Olympic Development Program coach, and has earned the USSF A License coaching certification. A two-time state champion at Highland High School, Becker played at Ithaca College and with the German Hungarian Metros in Queens. After three seasons as the club’s primary goalkeeper, Skonieczny will add coaching responsibilities to his role this season. The 2017 All-NPSL Second Team goalkeeper and former state champion at Arlington High School, spent his college career at Siena and Marist. After leaving Siena as the all-time leader in goals against average (GAA), Skonieczny collected eight shutouts for Matt Viggiano’s Marist Red Foxes in 2011. Skonieczny has experience coaching with Game Saving Academy, Wilder Goalkeeper Academy and Marist women’s soccer. He is currently the the assistant coach and goalkeeper coach at Byram Hills High School and holds a United Soccer Coaches Level 1 / 2 Goalkeeper Certification. John Nunez, Doctor of Physical Therapy with Feldman Physical Therapy and Performance, has been an integral part of the Stockade FC success. Nunez will again lead Stockade FC’s fitness efforts by focusing on the physical well-being of the athletes, including developing and implementing fitness, recovery, nutrition, rehabilitation and self-care guidelines for the team both on the field and at home. David Lindholm and Steve Sutton, who were members of last year’s coaching staff, will serve as advisors to the technical staff. KINGSTON, N.Y. – Kingston Stockade FC announced on Thursday that Nick Hoffay, who has been working with the club since its first season in 2016, has been named Director of Scouting. In the role, Hoffay will be responsible for finding top talent to play for the club, interacting with players, coaches, and administrators, as well as assisting the coaching staff’s preparation for opponents. Since the club formed prior to the 2016 NPSL season, Nick Hoffay has been working with Stockade FC Chairman Dennis Crowley, his brother Dan Hoffay, and coaches to form the team. He has communicated regularly with local players, college coaches, and local high schools and clubs to find the best talent in the Hudson Valley. His role has also included various team operations responsibilities. “I look forward to working closely with our new staff and college coaches in the area as we build a competitive team both for next season and years to come,” said Hoffay. Born and raised in Highland, Hoffay graduated from Highland High School and SUNY Dutchess, and was a club coach, board member, and club player representative for Highland United Soccer from 2014-2017. He is the treasurer of the Hudson Valley branch of the American Outlaws, a United States National Team supporters group. He currently works for the New York State Bridge Authority. KINGSTON, N.Y. – Kingston Stockade FC has appointed Dan Hoffay, whose work with the club since its inaugural season has been instrumental in the team’s success, as its Technical Director. In the post, Hoffay will oversee the operations of the first team, working closely with the Head Coach, and will play an instrumental role in the future growth of the club’s youth efforts. Joining Stockade FC in 2016 ahead of the team’s first season, Hoffay has worked in the operations of the first team, assisting with everything from practice and game scheduling, travel logistics, tryout organization and player recruitment, social media, communication with the NPSL and member clubs, and more. In addition to his work with Stockade FC, Hoffay currently serves as an assistant coach for the SUNY Ulster men’s soccer team, and previously was the head coach of the FDR Boys Varsity, leading the team to a 12-3 record in 2016. He coached teams ranging in age from U12 to U23 at the Highland United Soccer Club, also serving on the organization’s board and as a tournament director from 2014-2017. He is a co-president and founder of the Hudson Valley chapter of the American Outlaws, a supporters group for the U.S. National Teams, and volunteers with the Michael Oremus Foundation. Outside of soccer, Hoffay serves as a fourth-grade teacher at E.C. Myer Elementary in the Kingston City School District. He graduated from Highland High School in 2006, where he was coached by current Stockade FC captain Jamal Lis-Simmons, earned a B.S. in Elementary Education and Special Education from the College of Saint Rose in 2010, and an M.S. in Literacy Education from Mount St. Mary College in 2014. Kingston Stockade FC competes in the semi-professional National Premier Soccer League (NPSL), the fourth division of American soccer, and has achieved unprecedented success in just three full seasons, winning a conference championship in 2017 and competing in the U.S. Open Cup in 2018. The club is committed to helping improve and develop lower-division soccer in theUnited States, through an open-source and accessible approach. Coach Lindholm thanking Stockade FC fans after the 2017 NPSL Northeast Regional Semi-Final. KINGSTON, N.Y. – Kingston Stockade FC announced on Monday that David Lindholm, who served as the club’s Head Coach for the past two seasons, has stepped down from the post. Lindholm joined Stockade FC prior to the 2017 season, helping the club to a conference championship and a 7-4-1 (W-L-T) record in his first year. The team also earned a berth in the 2018 U.S. Open Cup. In his second season, the team had a 3-5-2 record with highlights including a 5-1 win over Boston City FC at home and a come-from-behind 4-4 draw with defending national champions Elm City Express. The club has already begun the process of selecting a new Head Coach and expects to make an announcement in the near future. 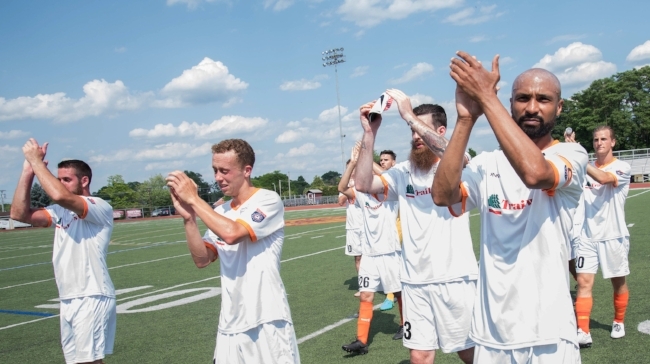 KINGSTON, N.Y. — In the final home match of the season, Kingston Stockade FC topped Boston City FC, 5-1, in front of 646 fans at Dietz Stadium. The win gives Stockade a record of 3-2-4 (wins-draws-losses) on the season, and moves their goal differential to a +2. Stockade opened the scoring in the 15th minute with a goal from Michael Creswick. Creswick slotted home after an attempt from Pedro Espindola forced a save from the Boston City goalkeeper. Stockade then went up 2-0 in the 18th minute, courtesy of a goal from Juan Parada. Josh Maley had the assist. Parada then headed home for his second goal of the day in the 38th minute, off of a cross from Scott Zobre. Espindola then found the back of the net himself in the 45th minute, off of another assist from Zobre. Boston City then dug themselves a bit of a deeper hole in the 45th minute after Jackson Leite was sent off on a straight red after a hard tackle on Espindola. Boston City got one back in the 53rd minute to make it 4-1. Stockade continued to apply pressure the rest of the way, and converted once more in the 65th minute after Nick Shenberger put home a loose ball in the box. After the match, Stockade head coach David Lindholm talked about the win being a fitting home send-off for the players who have put in the hard hours this season. "I'm really pleased for the players," said Lindholm. "They got rewarded for all the hard work that they've put in throughout the year. The squad always shrinks over the course of a season like this. We're all amateur players, so some people can't keep playing. And the guys that were here tonight are the guys who have been really dedicated, really focused on the job all season, came out and trained hard every day, and they get a reward of being able to get a big win against a rival of ours. A team that we love to beat." Lindholm also looked ahead to the last match of the season against the New York Cosmos, and how his team will approach the top team in the conference. "I'd say that (playing the Cosmos) is a great opportunity for us as a club, and for us as players," said Lindholm. "Just as a team, you always want to play against good teams, and we have an opportunity, I think, depending on the result tonight, to be the first team that knocks them off this season. And we'll look at the results, and maybe we'll still have a shot at the playoffs when we hit them, and then we'll know what we need to do, which is get a win, and again, if we were going to make the playoffs, we'd have to beat teams of that caliber anyway, if we want to anything there, so it's a great opportunity for us." Stockade heads to New York Cosmos on Saturday, July 7 at 7PM.